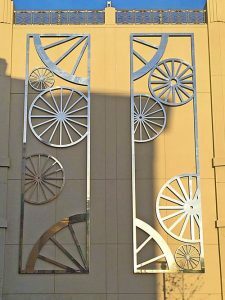 Did you notice the large new pieces of artwork at the Main Street Cupertino parking garage at 19401 Stevens Creek Blvd.? We got some details: The piece is by internationally recognized public-space artist Barbara Grygutis, commissioned to create over 75 large-scale works of public art throughout North America. 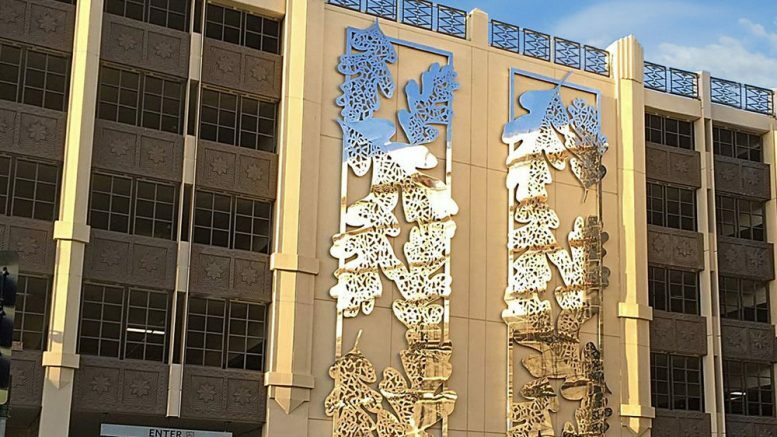 The parking garage is covered with bas relief and laser cut aluminum of foliage and wagon wheels. It is Grygutis’ attempt at connecting Cupertino history with the beauty of the community. “I’m very interested in natural forms and the effect they have on people and how they influence the way we think,” Grygutis said about her piece. This is the first art piece in a series of work that will be added to Main Street Cupertino. Community members can expect four sculptures added to Main Street in the near future. For more of Barbara’s work, click here. Be the first to comment on "Artsy addition to Main Street Cupertino"